Primitive reflexes are repetitive, automatic movements that provide the foundation for all motor coordination skills. 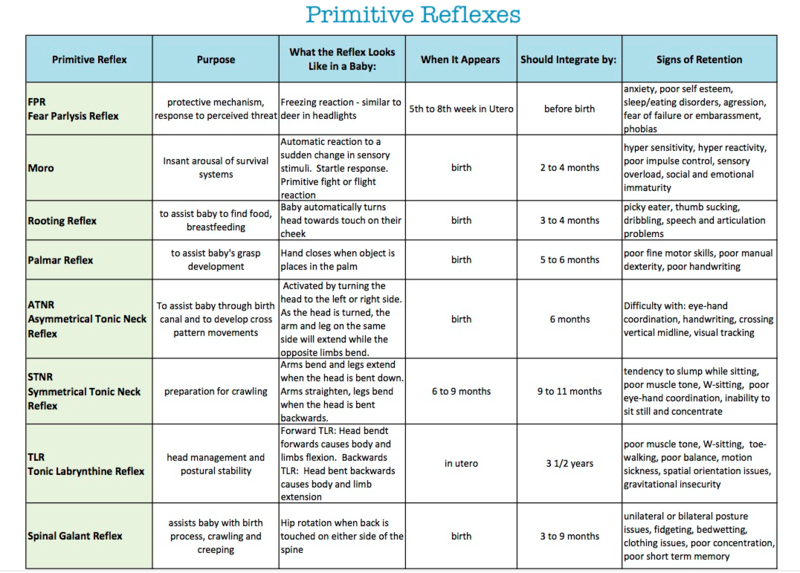 Primitive reflexes are essential during infancy to develop head control, muscle tone, sensory integration and visual development. Integration of these reflexes is necessary for a child's development of spontaneous postural movement and proper visual-motor development. ATNR (asymmetrical tonic neck﻿ reflex) - ﻿The ATNR reflex is activated by turning the head to the left or right side. As the head is turned, the arm and leg on the same side will extend while the opposite limbs bend. If not fully integrated, the ATNR reflex can cause difficulties with: hand-eye coordination, written expression, crossing midline, visual tracking, bilateral integration (use of both sides of the body simultaneously), and hand-dominance. STNR (symmetrical tonic neck reflex) - The STNR reflex causes the arms to bend and the legs to extend when the head is bent down and causes the opposite - legs bent, arms straight - when the head is bent backwards. If the STNR reflex remains present in an older child, it can cause difficulty with: integration of upper and lower portions of the body, sitting posture, typical muscle tone development, and poor hand-eye coordination. TLR (tonic labyrinthine reflex) - The TLR is associated with balance and coordination of the extremities. This reflex is activated by bending the head forward or backwards (head forward - the body and limbs curls inwards, head backwards - the body and torso straighten and extend). If not fully integrated the alignment of the head with the rest of the body will be uncoordinated. Proper head and neck alignment is necessary for balance, visual tracking, auditory processing and organized muscle tone, which are all vital to the ability to focus and pay attention. Moro - The Moro reflex serves as a baby’s primitive fight or flight reaction. It is usually inhibited by around 4 months of post-natal life and replaced by an adult “startle” reflex. When the moro reflex is retained in an older child it becomes an automatic uncontrollable overreaction to any type of stimulus, therefore overriding the higher decision making center of the brain. Retention of the moro reflex can present the following challenges: hyperactivity, extreme sensitive to sudden movement, noise or light, sleeping problems, impulsive behaviors, inappropriate behavioral responses, food sensitivities, emotional and social immaturity, poor adaptation skills. Palmar - The Palmar Reflex refers to the automatic flexion of the fingers over the thumb whenever the palm is stimulated. This is why when you put your finger in a baby’s hand, they immediately grab on to it. Once the reflex is initiated is takes time to relax so that when something is grasped cannot be let go until the grasp relaxes. Retention of the palmar reflex can cause poor in hand manipulation skills, poor finger dexterity, poor pencil grasp, difficulty with writing tasks. Spinal Galant - The spinal galant reflex exists to help babies move their hips as they move through the birth canal and is elicited when the side of the lower spine is stroked gently. If not fully integrated, it can result in difficulties with potty training, concentration, posture, and digestion and can cause excessive fidgeting and hip movement while seated in a chair.